Japan Karate Association (日本 空手 協会; Nihon Karate Kyokai; JKA; sometimes referred to simply as Kyokai 協会 in Japan) is one of the most influential Shotokan karate organizations in the world. It is also one of the oldest karate organizations continuously in operation until the present. Gichin Funakoshi played a major role in introducing karate from Okinawa to Japan, adjusted to reduce injury and merged with approaches for athletic training. On May 27, 1949, some of his senior students, such as Isao Obata, Masatoshi Nakayama, and Hidetaka Nishiyama, formed a karate organization dedicated to research, promotion, events management, and education: the Japan Karate Association. Funakoshi, then around 80 years old, held a position equivalent to emeritus chief instructor. Nakayama designated as the chief instructor. The JKA emerged from karate clubs at Japanese universities located in the Tokyo region. Most of these universities, however, distanced themselves from the JKA during the 1950s. Takushoku University always kept strong ties with the JKA, being the alma mater of many of the senior JKA instructors, such as Nakayama, Nishiyama, Okazaki, Asai, Kanazawa, and Enoeda, who were responsible for the JKA's consolidation during the 1960s and 1970s. General uneasiness on how karate was taught by the JKA instructors and disagreements on Funakoshi's funeral arrangements in 1957 motivated some of the senior karateka connected with Funakoshi, but not associated with the JKA, such as Shigeru Egami, Genshin Hironishi, and Tsutomu Ohshima, to form their own organizations, such as Shotokai and Shotokan Karate of America). They claimed to practice a version of Shotokan karate closer to what Funakoshi taught, as compared to the JKA style. The JKA Shotokan approach is also based on Funakoshi's karate, but with significant adaptations introduced mostly by Nakayama, who was JKA chief instructor until his death in 1987. Under Nakayama's leadership, a generation of respected instructors spread karate worldwide, guided from the JKA's headquarters in Tokyo. Nakayama's books, which include Dynamic Karate and the Best Karate series, are fundamental references on Shotokan karate as practiced under the JKA. Clive Nicol, in his classic book Moving Zen, describes the karate practice at the JKA's honbu dojo (headquarters training hall) in Tokyo during the early 1960s, from his unique perspective as a western karate student going from white to black belt in a few years. In 1977, JKA instructor Shiro Asano formed his own organization, and invited master Hirokazu Kanazawa to take his place as chief instructor. The group is now known as Shotokan Karate-Do International Federation (SKIF). Following Nakayama's death in 1987, the JKA experienced a turbulent period, both at the Tokyo headquarters and worldwide. Taiji Kase and Hiroshi Shirai, senior JKA instructors in Europe quit to form the World Karate-Do Shotokan Academy. Taketo Okuda, JKA chief instructor in Brazil, quit to focus on his own organization, Butoku-kan. In 1990, a legal dispute started between two groups about the control of JKA. One group was led by Tetsuhiko Asai, the other by Nobuyuki Nakahara. After several court rulings, the issue was ultimately settled by the Japanese Supreme Court on June 10, 1999, in favor of Nakahara's group, which included Masaaki Ueki and Masahiko Tanaka. The other group, led by Tetsuhiko Asai, JKA chief instructor after Nakayama, and including Keigo Abe and Mikio Yahara, left JKA to form other organizations: Japan Karate Shotorenmei, Japan Shotokan Karate Association, and Karatenomichi World Federation, respectively. In 2007, the International Shotokan Karate Federation (ISKF), with headquarters in the US, led by Teruyuki Okazaki, 10th dan and one of the most senior JKA instructors, became independent. However, by 2010 at least two senior Instructors returned to JKA. In 2009, Takahashi Shunsuke broke away from JKA Australia to form the TSKF Australia (Traditional Shotokan Karate-Do Federation). TSKF joined Teruyuki Okazaki's ISKF in 2011. By 2011, it was acknowledged that Masao Kawasoe, 7th Dan JKA, had returned to the JKA. Due to these divisions, there is today the notion of a separate JKA karate style—that is, Shotokan karate that follows the JKA tradition to a large extent, but is taught by instructors who are not officially affiliated with JKA (though most of them are former JKA instructors and graduates). In 1956, the JKA started its kenshusei instructor intern training program at the JKA honbu dojo, in Yotsuya, Tokyo, which had been built in 1955. This program was instituted by Masatoshi Nakayama. The training program has promoted the consistency and quality control of JKA training practices over the years, graduating some of the world's most well known karateka (practitioners of karate), as listed below. The following table lists JKA kenshusei training program graduates in order of year of graduation. The reported rank of graduates no longer with the JKA is that from their current organization. Such rank is not necessarily recognized by the JKA. Itaya Michihisa 1963 6th dan South America JKA - "Deceased 1972"
Okamoto Hideki 1967 8th dan Egypt - "Deceased 2009". The list at the JKA's website, which includes most members who left or were expelled, may also be incomplete. The JKA has not included some former members who have completed the course and are not currently affiliated with JKA. In addition, during the troubled period between 1990 and 1999 each JKA faction held its own instructors' course. Currently, the JKA does not recognize graduates from the instructors' courses led by the JKS (Japan Karate Shoto Renmei, which also held the name JKA between 1990 and 1999). Karateka such as Dave Hazard (UK), Ennio Vezzuli (Brazil), Nigel Jackson (South Africa), Peté Pacheco (Portugal), Malcolm Fisher (Canada), Leon Montoya (Colombia), Richard Amos (UK, US), Pascal Lesage (France) and others, are mentioned in karate forums as having completed the JKA instructors' course (or having had substantial participation in it) but do not appear on the list of graduates as published in 2008 on the JKA's website. Although Gichin Funakoshi wrote that there are no contests in Karate, Nakayama Masatoshi teachings led to more scientific and competitive approach to the training and in 1957 the first All Japan Karate Championship was held, and has been held annually since. ^ "World Karate Federation". Franceshowakan.com. Archived from the original (JPG) on 14 December 2014. Retrieved 21 December 2014. ^ "Black Belt December 1986". Books.google.co.uk. Retrieved 21 December 2014. ^ a b c d Cook, Harry (2001). Shotokan Karate: A Precise History. England: Cook. ^ Evans, J. K. (1988): "The battle for Olympic Karate recognition: WUKO vs. IAKF." Black Belt, 26(2):54–58. ^ Noble, Graham. Master Funakoshi's Karate Dragon Times (retrieved on January 8th, 2008). ^ Nakayama, Masatoshi (1997). Dynamic Karate. Japan: Kodansha International. ^ Nakayama, Masatoshi (1997). Best Karate Vol 1 to Vol 11. Japan: Kodansha International. ^ Nicol, Clive; Kanazawa, Hirokazu (2001). Moving Zen: One Man's Journey to the Heart of Karate (Bushido - The Way of the Warrior). Tokyo & New York: Kodansha International. ISBN 978-4-7700-2755-9. ^ "菼AiJKSj". Jks.jp. Archived from the original on 4 February 2015. Retrieved 21 December 2014. ^ "JSKA - Japan Shotokan Karate Association". Jskjp.org. Retrieved 21 December 2014. 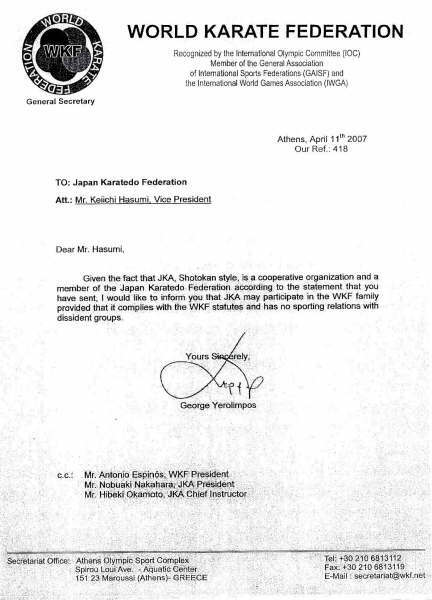 ^ "- KWF - Karatenomichi World Federation". Kwf.jp. Retrieved 21 December 2014. ^ "Terry O'Neil Interviews Dave Hazard". Fighting Arts International, Issue 49, 1988. ^ "CURSO DE INSTRUTORES DA JKA". Karateca.net. Archived from the original on 10 July 2012. Retrieved 21 December 2014. ^ a b c d e f g h i j k l m n o p q r s t u v w x y z aa ab ac ad ae af ag ah ai aj ak al am an ao ap aq ar as at au av "JKA official website - Past International Tournaments" (PDF). Jka.or.jp. Archived from the original (PDF) on 19 December 2010. Retrieved 21 December 2014. ^ a b c d e "船越義珍杯 第13回 世界空手道選手権大会 結果". JKA 公益社団法人日本空手協会. Retrieved 21 December 2014. ^ Cite error: The named reference JKAresults15 was invoked but never defined (see the help page).